VANCOUVER — Gaynors Automotive General Manager Tommy Gaynor and his family have a long history with the auto racing industry. And, for the past 32 years, Gaynors Automotive has established a legacy as a go-to destination for those with an automotive repair need. This week, those two histories merged to provide an assist by the Vancouver business to the promotions crew in the area for this weekend’s Grand Prix of Portland. It all started when Gaynor received a phone call from Davey Hamilton, an official with IndyCar’s sanctioning body. Gaynor and his team sprang into instant motion. The car was delivered to Gaynors Automotive’s Salmon Creek location on Sunday morning. Gaynor knew exactly which of his long-time technician’s to assign the task to, Pat Clark, a 15-year employee of Gaynors Automotive and a 25-year veteran of the automotive industry, got the call. Gaynor and Clark were briefed on what broke on the car and the IndyCar folks arranged for one of their own to travel to the Vancouver-Portland area with parts. The plan was more cost effective and reliable than trying to have the parts sent independently. Clark was also instructed that he was working under a tight time frame. The car had a vital role in a full promotional schedule this week, beginning Tuesday morning at 9 a.m. at KGW’s building in downtown Portland. Gaynor was told by IndyCar officials that the repair job would take about six hours under perfect circumstances at their location back in Indianapolis, Ind. At any other shop, it was estimated the repairs would take at least 12 hours. “It was literally an hour procedure just to jack this car up if you don’t have their special jack because the body work and structure is all carbon fiber,’’ Gaynor said. The repair, a broken chain in the transfer case, required that the car needed to be taken apart into two pieces. Thanks to the team effort, including a welding job at Swan Island Sheetmetal Works in Portland, Clark and crew had the street-legal car finished by 12:30 p.m. on Monday. For Gaynor, the entire experience reminded him of when he was in a similar situation with his own race car while in Chicago. As a result of his role in the repair, Clark and his family will be VIP guests at this weekend’s Grand Prix of Portland. 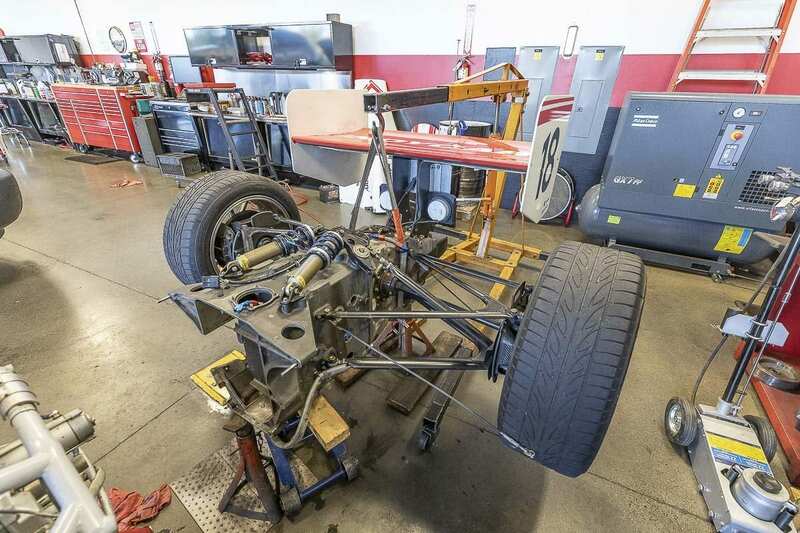 “This is probably the one time in his career Pat’s going to work on an Indy car,’’ said Gaynor, who was proud to be trusted with the repair and happy that Clark and his team executed it flawlessly. For more information about Gaynors Automotive, go to www.gaynors.com. For more information about the Grand Prix of Portland, go to www.http://portlandgp.com/. Gaynor’s Automotive services about 1,600 vehicles each month at its four Clark County locations.